Pescadero State Beach is no simple place. Scanning its expanse, you can see ocean beach, streams, grasses, cattails, bushy scrub, and tall, ancient trees. If you look more closely you can see over 250 species of birds. The landscape, especially at the water, is never the same two days in a row. 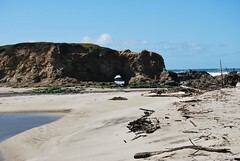 The beach is located 14.5 miles south of Half Moon Bay on Highway One. For the hike shown in this Exploration, you’ll be starting from the main parking lot, going down the stairs and walking a short stretch N on Hwy 1 before stepping down to the beach itself. Dogs are prohibited on the beach and in the Natural Preserve at all times.Please, NO beach fires are allowed. Please refrain from removing shells, driftwood, and other natural beach features. Fireworks are prohibited. From ocean beach to bushy hillsides, Pescadero State Beach encompasses many different habitats. Pescadero State Beach—a mile-long stretch just south of Halfmoon Bay in Northern California—is no simple place. Scanning its expanse, you can see ocean beach, streams, grasses, bushy scrub, and tall, ancient trees. If you look more closely you can spot some of the more than 250 species of birds that make their home here. The landscape, especially at the water, is never the same two days in a row. This park is a typical example of an estuary—an ecosystem both inviting and complex that thrives on change. Estuaries are coastal areas where fresh water from rivers mixes with salt water from the ocean. Estuaries usually contain a variety of habitats, and are constantly affected by the changing tides and ocean swells, as well as the seasonal ebb and flow of streams. Humans, too, exert their changes, shaping these environments. The Bay Area, where many rivers meet the sea, is especially rich in this kind of coastal ecology. Once, an enormous amount of the Bay Area was estuary, including much of the Pacific coastline and most of the water’s edge in San Francisco and San Pablo Bays. Today, many of these natural areas have been filled in or paved over. Estuaries play a number of important roles in the health of the natural environment. They keep erosion under control, help stabilize coastal communities, and protect water quality. They are also home to many of our commercial fish, as well as an extremely diverse set of flora and fauna. And, of course, estuaries are lovely places to visit and appreciate nature. 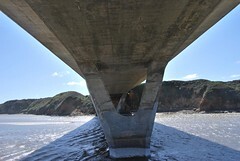 The ecosystem at Pescadero State Beach includes a stretch of Highway 1 as well as other areas containing man-made alterations. Because estuaries are so dynamic, they respond quickly to the forces that humans exert on them—and those forces are many. Pollution from nearby communities and agricultural land can end up in the runoff that fills estuaries. Often this runoff contains an excess of nitrogen and phosphorus, nutrients that algae love, and that can lead to algal blooms. An overpopulation of algae can rob the water of oxygen, leaving too little for fish and aquatic plants. Scientists working at Pescadero State Beach and other estuary areas keep an eye on water quality issues like this, hoping to keep plant and animal populations healthy. Estuaries can experience habitat loss—a shrinking of the land available to be part of the estuary—both naturally and at the hands of humans. Natural fluctuations in tides and water flows can erode or shift shorelines. Sediments left behind by fires and floods can degrade the quality of the ecosystem. And development of coastlines for housing or agriculture can greatly affect, or even destroy, an estuary. Even in areas where the actual landscape is less threatened, the pattern of flora and fauna on that landscape can shift. Often this kind of shift is due to the introduction by humans of non-native species. Sometimes, these new species fare better than the native species. These new plants and animals, which may have been introduced recently or centuries ago, can crowd out the original inhabitants of an environment This phenomenon is evident at Pescadero State Beach. Some areas of the dunes, for example, have been taken over by non-native grasses that have pushed out the native grasses. And in some forested parts of the park, the eucalyptus trees introduced by travelers and found plentifully in this park (and in many other parts of the Bay Area), have crowded out other tree species. These tall trees are eucalyptus, non-native plants that now serve as home to Pescadero State Beach’s nesting heron population. 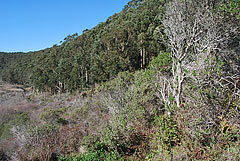 But those eucalyptus trees also provide an example of the complications of restoring an estuary. You might think it would be easy to restore balance by simply removing the invading species from the environment. But at Pescadero State Beach, for example, a tall stand of eucalyptus provides shelter for a heron rookery. Getting ride of these “weed” trees would mean losing valuable nesting areas for heron. In other cases, endangered species that ecologists might want to protect may have adapted to conditions—like changes in salinity or nutrient levels—that have negative affects on other native species. Because estuaries are such ephemeral, dynamic systems, adaptations like these may take place more quickly than they would in other environments. Complications like these illustrate how difficult it may be to see the best approach to restoring an area. There’s still a great deal that scientists don’t know about estuaries; the ways in which the various environments within an estuary affect one another can be very complex. To protect or restore these areas, ecologists think of the environment’s flora and fauna not as specific species or sets of species, but as whole systems. Researchers conduct studies to try to understand how the balance of oxygen, nutrients, pollutants, and other factors affect water quality and wildlife. A healthy estuary is one in which the water is clean and the habitat can support both the wildlife and the human recreational uses of the area in a self-sustaining way. Join the Pescadero State Beach photo group on Flickr to share your photos of this amazing place. Craig Rosa is KQED's Senior Interactive Producer for Science & Environment. Prior to joining KQED in October of 2006, he spent 11 years with The Tech Museum of Innovation in San Jose, where he worked to create innovative educational visitor experiences online and within the museum space. He was also responsible for the museum's Information Services operations. He began his informal science interpretation career at the Brooklyn Children's Museum as an Assistant Exhibit Developer and Greenhouse Program Coordinator. Craig has a B.A. in World Arts and Cultures from UCLA, and an M.A. in Performance Studies from New York University. Robin Marks is the owner and operator of Discovery Street Tours, which offers science-themed walking tours in San Francisco. 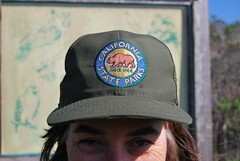 She is also a long-time science writer, and president of the Northern California Science Writers' Association. She loves to climb big hills, investigate tidbits of everyday life, and do chemistry experiments with her food. Prev Reporter's Notes: Where's my Hydrogen Highway Next Where's my Hydrogen Highway?